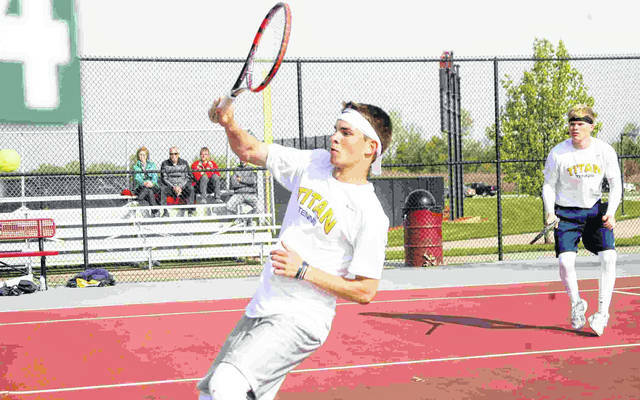 LIMA — Shawnee won singles and doubles titles Saturday at the Division II boys tennis sectional at UNOH. Jackson Schaaf defeated Bluffton’s Justin Haggard 7-6 (7-3), 6-1 for the singles crown and Michael Rutter and Isaac Hanover topped Celina’s Bryce Langenkamp and Kyle Lochtefeld 6-2, 6-2 in the doubles championship. Lima Central Catholic’s Ben Brinkman defeated Van Wert’s Michael Etter 6-2, 6-0 in the singles third-place match. In an all Ottawa-Glandorf doubles third-place encounter, Craig and Kevin Recker defeated Zach Balbaugh and Drew Kuhlman 6-2, 6-4. At Defiance, Ada’s Zach Beaschler defeated Ottawa Hill’s Matthew McGee 6-4, 6-0 for the singles title. 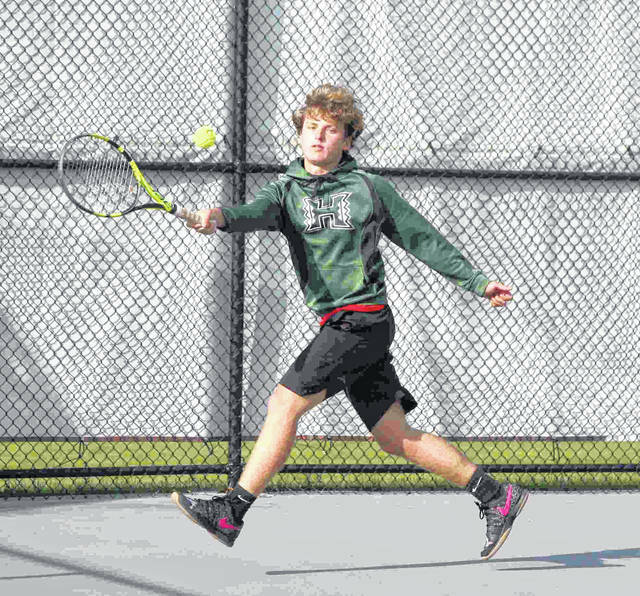 Ada’s Cade Mullins topped Wauseon’s Tristan Uribes 6-1, 6-1 for third place. The top four singles and doubles teams from each sectional advance to the district starting at 10 a.m. Wednesday at Bowling Green State University. FINDLAY — The Wapakoneta doubles team of Curtis Hughes and John Doll lost 2-6, 6-3, 6-3 to Defiance’s Drew Klausing and Zach Tettenhorst in the third-place match. 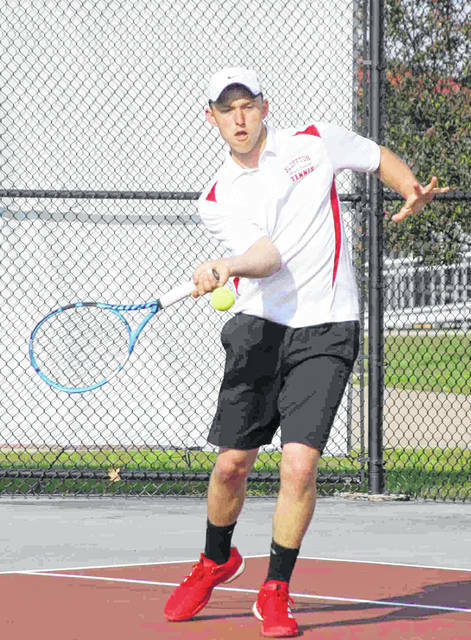 Due to a conflict, Wapak’s Jordan Moening had to default on his semifinal and third-place matches in singles but still advanced to the district being held at BGSU beginning at 10 a.m. Thursday along with Hughes and Doll by finishing among the top four. LEIPSIC — The visiting Bulldogs finished their Putnam County League schedule 6-0. Danielle Bame had three hits, including two home runs with one being a grand slam, and eight RBI, Jenna Hardeman had four hits, Madison Nusbaum had three hits and three RBI, Teyah Sautter, Angel Schneider and Emily Watt each had three hits and two RBI, Tori Warnecke had three hits and Joy Stechschulte had two hits and an RBI for Grove. Kelly Scheckelhoff had two hits and four RBI, Bailee Sickmiller had two hits and two RBI and Summer Steingass had two hits and an RBI for Leipsic. KALIDA — Hannah Warn had three hits and two stolen bases, Makenna Hoyt had three hits, Melanie Meyers had two hits and Jaylen Vandemark had a hit and two RBI for Kalida. Kennedy Parker had two hits, including a home run for LCC. WAYNESFIELD — The Waynesfield-Goshen boys won the team title at the Northwest Central Conference Championships. W-G finished with 148 points with Upper Scioto Valley (82) and Hardin Northern (81) rounding out the top three in the nine-team event. Tyler Eller won the 100 and 400 and was a member of the winning 800 relay team along with Dustin Klenke, Alan Hatfield and Gabriel James, Brock Waitman finished first in the discus and shot put, Brandon James won the high jump and Gabriel James triumphed in the long jump for W-G. Eller’s time of 10.95 in the 100 was a stadium and NWCC meet record and Waitman’s winning discus throw of 164 feet, 7 inches set a meet mark. Temple Christian’s Cameron Worsham set a stadium and meet mark in winning the 300 hurdles in 40.08 with W-G’s Brandon James finishing second in 40.09. Worsham also won the 110 hurdles and the 200. USV’s Brady Hipsher was first in the 1,600 and 3,200 and teammate Korwin Kurtz won the pole vault. The Hardin Northern 1,600 relay team of Gabe Sheldon, Eli Cooper, Tyler Shepherd and Frank McCoy finished first. Lehman Catholic had the high girls team total of 152 points with Waynesfield-Goshen finishing second (86 points). The W-G 3,200 (Megan Barden, Kiara Roof, Claudia High and Rylie Barrington) and 1,600 (Ashley Werling, Barrington, Barden and Roof) each finished first. USV’s Megan Carey won the 100 hurdles and 300 hurdles and the high jump, W-G Savanna Spencer was first in the shot put and Ridgemont’s Meadow Cromer won the pole vault. VERSAILLES — Minster won the girls team title with 141.5 points with Versailles (124 points) finishing second. Versailles won the boys title with a 153 points and Marion Local (116.5) was second. VAN WERT — Jake Lautzenheiser had two hits and two RBI, Hayden Maples had two hits and an RBI and Darius Eddins had a hit and two RBI for the host Cougars. Nathan Arrington double and had two RBI for O-G.
COLDWATER — Brad Giere and Ross Weigel combined to allow four hits and no walks while striking out one in seven innings for the host Cavaliers. Seth Miller and Sam Broering each had two hits for Coldwater. DEFIANCE — Winning pitcher John Ceballos allowed one hits and two walks while striking out four in seven innings. Ethan Kemler doubled for Lincolnview.